Limited Time Offer On Invisalign – Just $3,995! Dr. Mears grew up in a dental family and was fortunate enough to constantly be surrounded and mentored by family and family friends in the dental profession. He began his journey to practicing dentistry by completing his undergraduate education at The University of Iowa where he studied cell developmental biology with an emphasis on anatomy and physiology. During this time of his education, he was a member of the President’s List and the Dean’s List for four consecutive semesters. He then went on to complete dental school at the University of Iowa College of Dentistry where he received his Doctorate of Dental Surgery (DDS). When not practicing dentistry Dr. Mears enjoys being active in the great Colorado outdoors. He learned how to ski at the age of three and grew up downhill racing and continues to search for the best snow. He also enjoys outdoor activities including hiking, mountain biking and running. What makes him smile? Spending time with family, friends listening to music and teaching his three and five year old nephews how to ski brings him great joy. 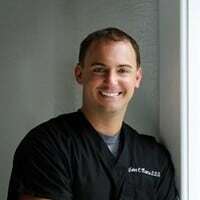 We cannot wait for you and your family to meet Dr. John Mears!